Premier Dunderdale's recent comments about the Nalcor - Hydro-Quebec dispute provoked a passionate response from a proud Labradorian. Update: here is a video recording of Dunderdale's remark. I've cut and pasted the comment so it is accessible to search engines. "Dunderdale says Quebec doesn't believe that Newfoundland owns Labrador, saying it all goes back to the boundary dispute." 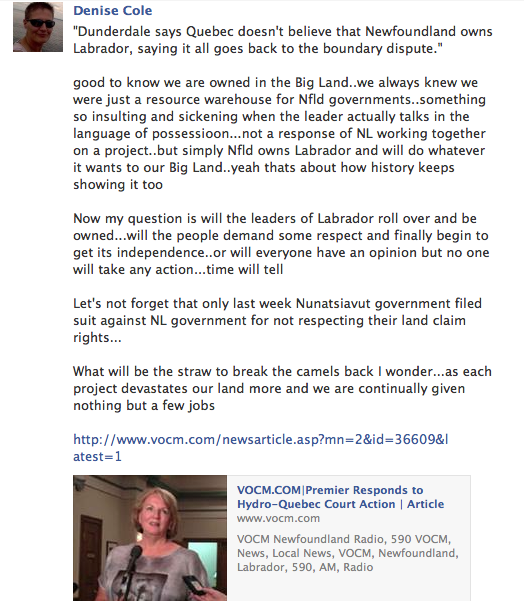 good to know we are owned in the Big Land..we always knew we were just a resource warehouse for Nfld governments..something so insulting and sickening when the leader actually talks in the language of possessioon...not a response of NL working together on a project..but simply Nfld owns Labrador and will do whatever it wants to our Big Land..yeah thats about how history keeps showing it to. Now my question is will the leaders of Labrador roll over and be owned...will the people demand some respect and finally begin to get its independence..or will everyone have an opinion but no one will take any action...time will tell.